People to inhabit the islands brought with them a series of domesticated animals and plants. They introduced agriculture, established fields and opened up the forests to create pasture and cut woody vegetation for fuel. As a result a managed and more productive environment was created, capable of supporting dense human population. Whilst beneficial, these changes also brought damage to the native flora of the archipelago. Moreover, the overgrazing of sheep and goat in the arid zones of the islands accelerated soil erosion. Currently the Foundation of many forests agricultural land, settlement, and industrial areas. The trees of the forest has been harvested for timber as a building material was taken. The abundance of wood needs for various purposes led to massive deforestation without paying attention to the sustainability of the forest. The destruction of forests led to flash floods, soil erosion, forest fires, its animals and plants to extinction, drying of springs and rivers, depletion of forest products, as well as global warming. All these phenomena adversely to human life. If we use the contaminated water, it will lead to the emergence of various types of diseases, can even result in death. Water pollution can be caused by certain activities, e.g. activities of households, agriculture, and industry. Air pollution comes from smoke exhaust combustion results in motor vehicles, industrial and household activities. Things that can be done to keep the air clean, among others, by reducing fuel consumption, finding alternative fuels, the efficiency of energy use of coal, a set of rules on motor vehicles emissions test, and plant the trees. Soil contamination occurs when there are foreign materials, both organic or inorganic, which causes the damaged land. As a result, the mainland cannot provide power support for human life. In the process of development, with the various needs of the mankind and the development of various types of industrial waste produced by humans are also the more varied. 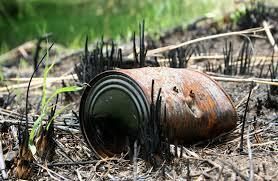 Inorganic waste are difficult to render or broken down by microorganisms so it takes a very long time to disintegrate and reunite with nature.